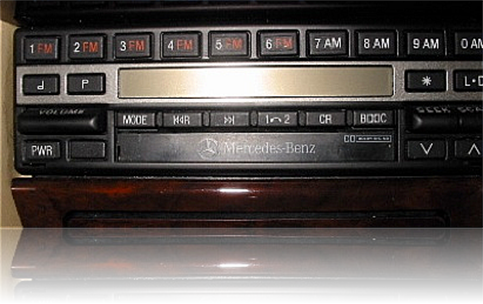 Used in the 1991-1993 E-Class, S-Class and SL-Class. This system has a BE1432 head unit in the dash and a BE 1532 tuner/receiver in the trunk. With the Sound System there are also two full-range amps (N40/1, N40/2), behind the trunk unit, driving 10 speakers. With the Active Bass System there is one amplifier (N40/3) driving six speakers. 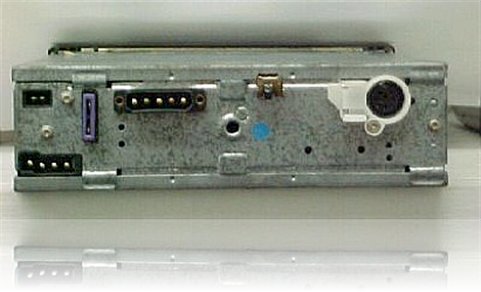 Note the 'MODE' button allowing integration with the Silverstone Model 980 (2630) CD changer. May also be integrated to the 6-disc Alpine CD-changer...see CHM-S620. "Standard on all S-Class and SL models, as well as the 300E, 300E 4MATIC� and 300CE*, is a special High Performance Sound System, which has been specifically engineered and equalized for the interiors of these particular models. Developing vibrant stereo power by means of separate audio power amplifiers, the system plays through ten high-quality speakers in the S-Class and 300 Class models: two low-frequency, two mid-frequency, four high-frequency and two midhigh-frequency units. The SL sound system has six speakers: two low frequency, two mid-frequency, and two high-frequency units. " * Optionally available on the 300 D 2.5 Turbo and the 300 E 2.6. The 1432 radio goes into CODE mode whenever the battery is disconnected, or the radio is removed, but the code is a 4-digit number entered into the radio via station pushbuttons, assuming you have the code number. Contact Becker if you need to get the proper CODE.